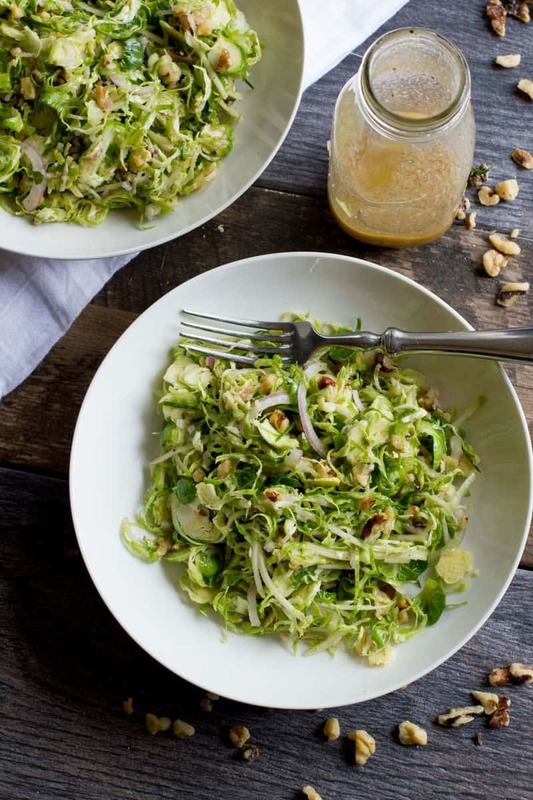 This vegan Shaved Brussels Sprout Salad with Apples and Walnuts is packed full of healthy, in-season flavor—perfect for the cool weather months! Nothing like a good vegan salad recipe in the middle of December to break up the deluge of sugar, eh? I made this shaved Brussels sprout salad for dinner on the same day I baked (and ahem, ate my fair share of) four dozen sugar cookies for my husband to take to school with him to treat his classmates during the final push of the semester. Balance. I normally try to follow the middle path style of eating—a typical day of eating for me will have lots of veggies, lots of fruit, plus a moderate amount of butter, cheese, and bacon, and a few touches of treats (like a square of dark chocolate or a good craft beer). Eleven months out of the year, I’m pretty successful about staying on the middle path. December? Not so much. In December, I swing with wild abandon between to the two extremes—super healthy and super unhealthy all at the same time—and hope like heck that it all balances out in the end. I used to get so mad at myself for derailing my healthy diet during December every year. Why couldn’t I just say no to my favorite chocolate chip cookies or that second glass of eggnog and amaretto (try it, it is life changing)? What was wrong with me? But a few years back, I decided I was sick of feeling so darn guilty about enjoying my favorite foods and drinks around the holidays. So I decided right then and there to stop feeling guilty. And I haven’t looked back. The fact of the matter is, I enjoy indulging in yummy (and sometimes unhealthy) foods with my friends and family. Food is my love language, and around the holidays, I speak my language of love loudly and proudly and with whipped cream on top. Now, with a little bit of perspective, I will even tell you that this same behavior that I thought was gluttonous only a few years ago, I now think is actually pretty darn healthy. Everything in moderation, including moderation. No, I’m not saying pounding back a dozen sugar cookies is going to win you any kind of praise from your cardiologist, but I do think it is a different, but equally important, kind of healthy. To me, eating the foods I love the most is good for my soul. And as much as I love a good veggie, you won’t see kale listed on my requests for a last meal. Honestly, I just flat out got sick of feeling guilty for feeding my soul. So I don’t anymore. It was one of the better decisions I’ve ever made. So I eat those not-so-healthy foods (and sometimes a lot of them). Especially during this sparkly, glittering, love-filled, happy time of year. And I enjoy every bite. And never feel a drop of guilt. My soul sings the songs of the cookie goddess. Sure, it means that come January, my jeans are a bit tighter, and I’m in desperate need of some veggies, but that ain’t no thing. Because the eating, drinking, and merriment I partake in with my friends during the holiday season is worth every single pound I gain. I see a lot of folks berating themselves for eating too much at the holiday party or challenging themselves to skip the cookies in the break room, and if those kinds of things are important to you, I wish you the best of luck in your goals. But don’t mind me while I’m happily sitting in the corner eating myself silly, drinking heartily, and laughing ’til I cry with my friends and family. Tomorrow, I’ll feed my body. Today, I’m feeding my soul. So what does all of this have to do with a shaved Brussels sprout salad? Well, like I said, I do try to swing to the other end of the food spectrum during December on the more “normal” days of the month (feeding my body, if you will). It can feel like December is this marathon of parties and dinners and events, but there are still more normal days in December than special ones, and on those normal days—where I’m not partaking in a boatload of merriment—I try my darndest to eat clean and green to help balance out the half pound of fudge I plan on eating over the weekend. I drink lots of water. I try to have a green smoothie every day. I slow down on the sugar. I slow down on the booze. I give my body a break so it can get good and excited for all the soul-warming it’ll be participating in later. 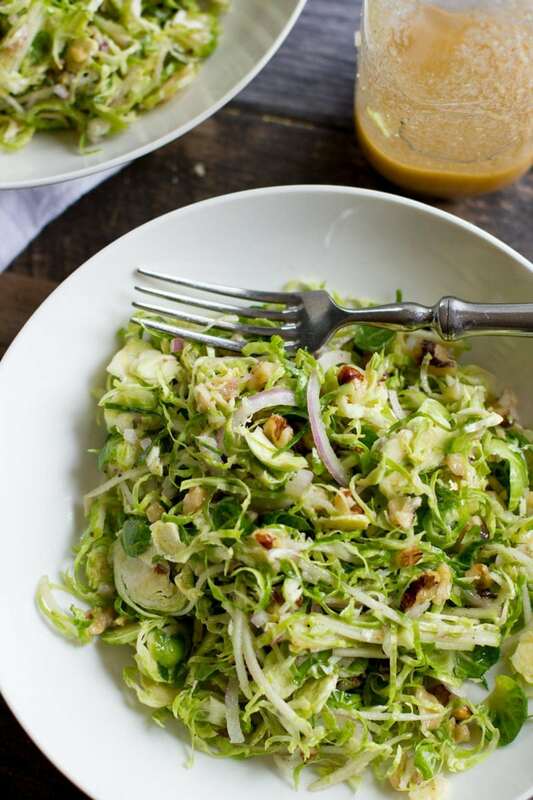 And this shaved Brussels sprout salad is a great, seasonal option for one of my healthier days. 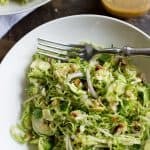 This salad is actually more of a slaw, where instead of traditional red or green cabbage, you use shaved Brussels sprouts. 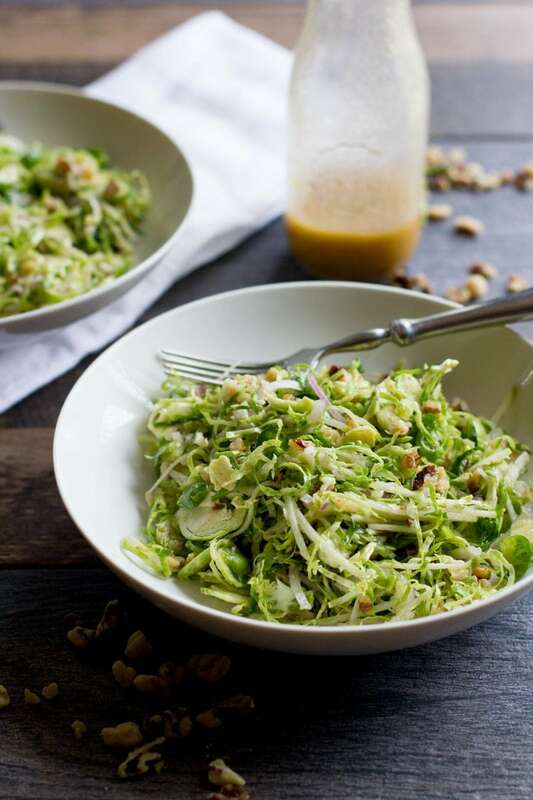 If you’re afraid of eating raw Brussels sprouts (maybe you just joined the Brussels sprouts bandwagon recently), let me tell you, you will love this. 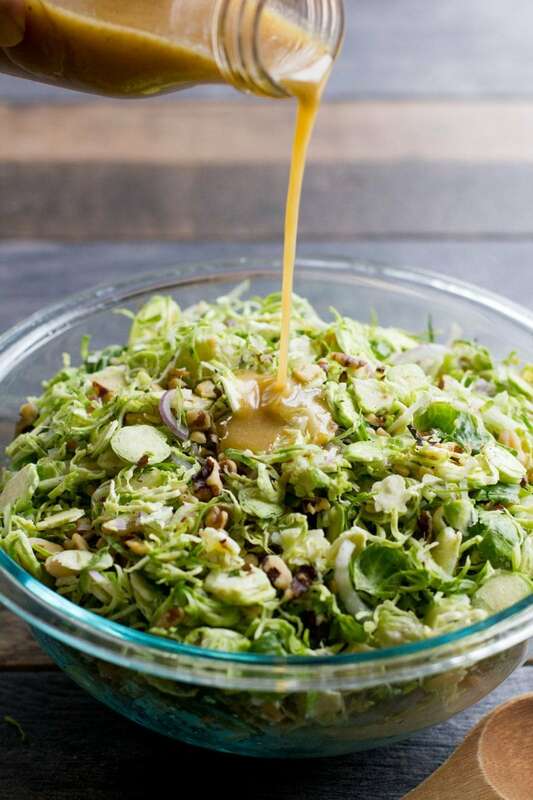 The sulphur flavor that a lot of people dislike about Brussels sprouts comes from cooking (specifically, overcooking) the sprouts. When you eat them raw? No sulphur flavor. They taste like super sweet cabbage! Perfect for this cool-weather salad. 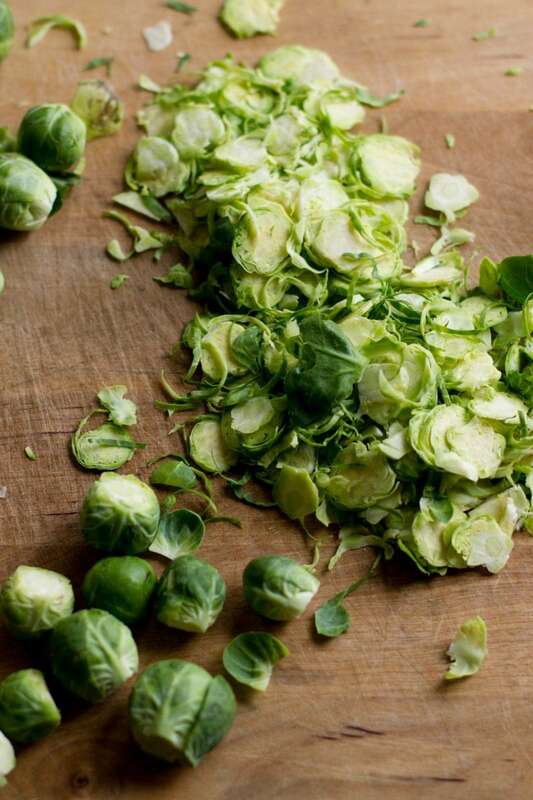 Now, a word of warning about shaving Brussels sprouts. If you have really great knife skills and a decent amount of patience, you can do it by hand with a knife, but if you are lacking in knife skills like I am, you’ll want to use a mandoline slicer. I always used to think a mandoline slicer was one of those annoying kitchen tools that chefs on TV always told me I needed to have but I actually didn’t. Until I got one as a gift. And then I totally fell for my mandoline (this is similar to the one I have, by the way). The mandoline makes such quick work of making pickles or potato chips or fries or anytime you need to thinly slice something. I love my mandoline! Now that I’ve told you to use a mandoline to shave Brussels sprouts, you have to promise me something. 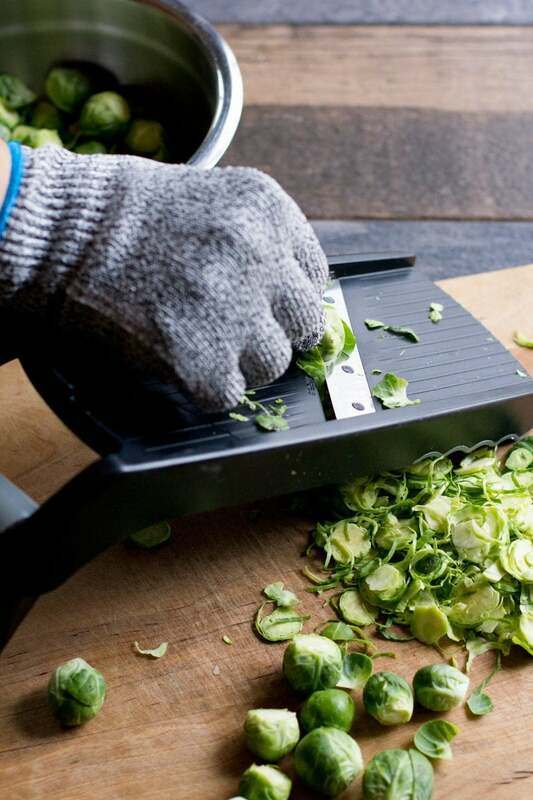 Swear to me you will never ever even think about trying to cut a sprout on a mandoline without wearing a no-cut glove on your hand. Swear it to me. Right now. On the grave of all the Brussels sprouts that have come before. I don’t care how careful you are, if you try to use a mandoline to slice Brussels sprouts without proper hand protection, you will (WILL!) cut yourself. And no, those little hand guard things that come with your mandoline don’t count (I swear I cut myself MORE when I use those things). Trust me, the $12 you spent on the no-cut gloves are well worth it to avoid the pain and suffering of getting your fingers sliced off on your mandoline. This salad is good, but it’s not good enough for you to lose any flesh. Just don’t, k? I care about you too much. Now that I’ve sufficiently frightened you into never making this salad, let me tell you exactly why you should make it! This salad is such an excellent way to bring fresh, raw veggies to the dinner table in the winter without having to head out and buy $20 worth of out-of-season ingredients. 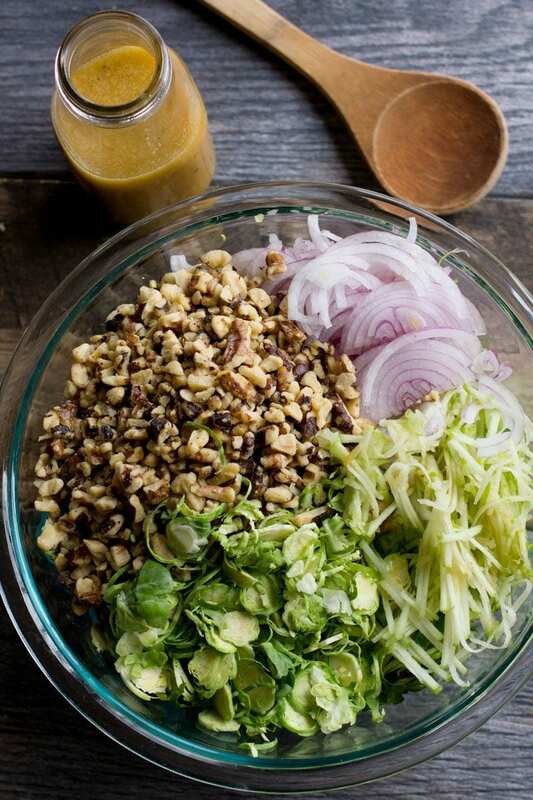 You can nab almost all of the ingredients for this salad at your local winter farmer’s market (they have those where you live, too, right?). It tastes fresh and healthy, but still hearty and filling—just like food should be when the temps are low. And the mustard maple vinaigrette that is on this salad? To die for. Great on this salad. Great on all salads, actually. If I were you, I’d just make up a big jar of the stuff and keep it in the fridge for whenever you need a cookie-balancing bowl of veggies. Enjoy! Trim the ends off the Brussels sprouts. Using a sharp knife OR using the thinest blade on a mandoline slicer (and a no cut glove) slice each sprout thinly. Slice the apple and red onion in the same manner. Combine in a large bowl. Toast the walnuts in a skillet over medium-high heat, stirring frequently, until fragrant and lightly browned, about two minutes. Add to the Brussels sprout mixture. Toss to combine. You know, that might just work! I have NEVER been able to get the slicing attachment to work properly on my food processor (it just pumps out giant chunks), but if you have more food processor skills than I do—DO IT! Update: the slicer worked great! My attachment is adjustable, so I put it on the thinnest setting. The grater with the apples? Not as much of a success. I’ll slice them next time! I have a nice Cuisinart food processor and used the slicing blade dialed onthe thinnest setting. To set the blade: the back of the blade attachment has a round plastic shaft, which dials up or down. Just dial it to the thinnest setting and it slices beautifully. This was delightful. Sublime. I used pecans because my wife has issues with walnuts. Great, simple salad with a nice kick from the Dijon and no real sweetness despite the syrup. I thought about using Agave instead but I stayed with the program and will do so many times. Good on Ya Cassie! I love your philosophy (maybe because I use it too:) – and your shaved brussels sprouts look divine. The only change I’d make to the recipe is to soak the red onion slices in lime juice to make them less pungent. It’s a trick I learned from an Ina Garten salad and now I eat raw red onions, which I never used to do. Enjoy the holiday season, without guilt and with much joy. That’s such a great idea! I’m such an onion fan, I could *almost* eat them like apples, but for those folks that aren’t quite as onion-obsessed as I am, that is a great solution! Thank you for the lime juice/onion tip. “My soul sings the songs of the cookie goddess” is the best thing I’ve ever heard! Food guilt is such a waste of time, isn’t it? I’m so with you on the “normal” day eating thing. When I zoom out and look at the bigger picture, I realize I eat way more good-for-me things than indulgent ones so I don’t feel bad about those less nutritionally dense choices. And the holiday season is too much fun to miss out on any of the cookies, pies, cocktails, etc. P.S. Eggnog with amaretto sounds SO GOOD. Oh goodness, do I know what you mean… some days the body just craves things like this! Whoaaaa. Thanks for this. The recipe (currently obsessed with shaved Brussels salads) and sharing your December food philosophy. Your post made me realize how miserable I’ve started the month, mostly because I have FOMO coupled with fear of gaining a ton of weight (FOGATOW?) I’m going to loosen up a little for special occasions, but make good choices for all other meals. Seems moderately doable for me. :) Wishing you all the best in this holiday season! I just finished making this. Added bacon crumbles. Would consider adding blue cheeses crumbles too in the future, but it’s just awesome! Do you use pure maple syrup or something like Mrs. Butter worth, etc.? Making this for a party this weekend … Sounds sooo delish! I love this salad and the vinegarette can be warmed as well…I add blue cheese as well. P.S. For a festive kick I add pomegranate seeds!! Yum! I made the salad last night for a group of about 20 women. I substituted balsamic vinegar for the red wine vinegar and red sweet apples for the green apples and it was just delicious. My guests all wanted the recipe. It was a real hit. Thanks for posting your recipe. Is it a bad idea to make this the night before? I want to use it for a side on Christmas Day and I’m trying to reduce the amount I need to do in the morning- two kids under 3 so I want to spend my time playing and not all my time cooking! I am trying the shaved Brussels and onion the night before….we will see. Any idea how many calories in a serving of this? Thanks! not only do I LOVE everything about this salad, I am in LOVE with how you look at eating. I used to try and deprive myself of the things I loved because I knew it would rack up the pounds. But this year for the first time, I let myself enjoy every bite of the holidays, and it was wonderful. Now, I actually look forward to my salads for lunch and yogurt for breakfast. Can you use honey instead of maple syrup and would you use the same amount?? I made this recipe exactly written, and it’s delicious. I just used a really sharp knife to slice the Brussels sprouts, apple, and onion, and it came together in no time. Will definitely add to the regular salad rotation at my house. I made this recipe 2 ways, the first was as written, and the second was warm: After I toasted the walnuts, I sauteed the onions until soft and then sauteed the Brussels sprouts. Then I added the (raw) apples and toasted walnuts and vinagarette. My husband and I both liked the sauteed version better. Great easy recipe! We love this recipe!! So fresh and healthy!! My friend’s son made this for a big party and it was a hit! I searched until I found the recipe and made it the next day! I substitute coconut oil for the olive oil for a little extra nutty flavor. Because the the coconut oil must be warmed to liquify, I pour the dressing warm over the salad, it seems to permeate the salad, but it reamains crispy. This is now a go to recipe. Thanks! Could you put the apple pieces and Brussel sprouts in a food processor??? With the shredder attachment, I would think you could! I love this recipe! I’ve added almond slivers and craisins instead of the apple,onion, and walnuts to make it a little bit healthier! I am just obsessed! I highly recommend this recipe to anyone! You won’t be disappointed!